BULLETIN: The SEC has gone to federal court in the Central District of California and alleged that a U.S. citizen running companies in New Zealand and relying on pitchmen in Utah and Louisiana operated a Ponzi scheme and stole millions of dollars from investors. A federal judge has approved an emergency asset freeze, the SEC said. Named defendants, according to the SEC, were Christopher A.T. Pedras, a U.S. citizen who resides in Turlock, Calif., and operates firms in both America and New Zealand; Sylvester M. Gray II of Kaysville, Utah; and Alicia Bryan of Bossier City, La. Pedras presided over “sham investment opportunities ranging from a bank trading program to kidney dialysis clinics,” the SEC said. The agency added that Pedras “advised investors not to respond if contacted by the SEC. “He characterized SEC investor questionnaires as ‘fake’ and stated that the SEC’s investigation was motivated by a ‘personal vendetta’ against him,” the agency said. The scams gathered at least $5.6 million from U.S. investors, the SEC said. 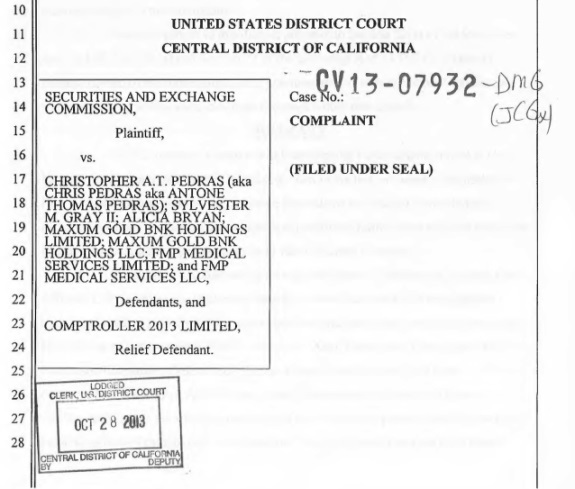 Corporate defendants include Maxum Gold Bnk Holdings Limited of New Zealand; Maxum Gold Bnk Holdings LLC of Nevada; FMP Medical Services LLC of Nevada; FMP Medical Services Limited of New Zealand. Pedras also is known as Chris Pedras and Antone Thomas Pedras, the SEC said.